From the tourney that so nearly didn't happen to one that was decided in the last 6 seconds!!!! Congratulations to Steve on nicking this crown and extra special thanks to newcomer, Carl, who responded to the calls, 'save the tourney, save the world!'. What an heroic debut!!!! I 've just come back "home" in London. I will come back for more soon. P.S. I played football with Ellie not Simon. She is good! 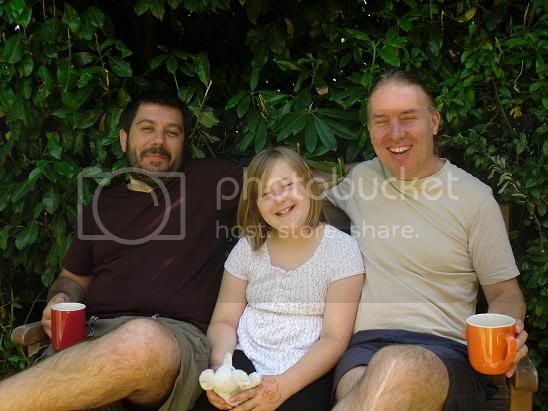 I rang Steve to discuss plans and agreed the three of us could play some KO2 friendlies instead. Texted Carl one last time explaining that if he could make it, it wouldn't be just any old debut, his would be a tournament-saving-heroic debut! By the time Steve arrived, we hadn't heard anything and we were resigned to the fact that the tourney definately wasn't happening. Just as we were heading out to the neighbours bbq, my phone rang - it was Carl. He would be with us later that evening. HELLAND IV was back on!!! It's great to welcome a newcomer at the best of times, but this felt extra special. He even brought a vuvuzela to the tourney (a new KOA trend?) via his nifty iphone app! Carl is a really nice, thoughtful guy too and I could feel his sense of amazement seeing the great game so alive and kicking as it is in KOA circles. It reminded me of when I first discovered this place and, recalling this, I felt energised too! By way of an ice-breaker and as a illustration of some the more common KO2 goals, we all played a KO2 Challenge to see how many goals we could score within a 3 minute practice period. With the on-off-on nature of the evening, time was now limited, so we were restricted to a x2 league, but we were just pleased to be having a tourney at all! After last night's 6-1 battering against Costas in the final match, I knew this opener was going to be a battle. I had to fight every inch of the way, and it was one of the those open games where the outcome wasn't clear until the later stages, with me just edging it 5-3. Phew! Carl hadn't played for some years other than some KO1 recently so he was rightly using this tourney to get the feel of it again, with trapping and aftertouch. I could tell he was enjoying this process, and the results (for now) were secondary. Steve meant business tonight and was clinical in punishing my defensive mistakes I made and deservedly claimed a 5-3 victory from our opener. Against Costas, there was absolutely nothing between us once again, apart from a last minute winner that gave me the 3 points I honestly didn't deserve. Unlucky mate. You'd already beaten and drawn with Steve tonight and we later agreed that had we had time for a third day of action, you'd surely be taking a title home with you. Myself and Ste both commented on how difficult it is to defend against your flowing and attacking 'balanced tactic'. Carl was certainly improving too, and came unbelievable close to claiming that sweet first KOA goal. A low shot hit with after-touch and parried by the keeper was temptingly waiting for his attacker to smack it in but he could quite position his striker quickly enough. It will come, I'm sure, and sooner than you think mate! I really like your spirit and hope you become a regular with Team KOBRA! We've got Blues and Villa supporters so we're in need of a Baggies fan too! Meanwhile, in the undisputed LOUDEST match of the night Ste, I believe, had come back from 0-4 to end the match 4-4! Similar to the night before, the table now showed me two points clear of Steve, with our final match title decider remaining. I remember I always felt like I had my nose in front in this one, 1-0, 2-1, 3-2 and 4-2 but UK Champion eats titles for breakfast. I certainly felt shreaded and beat when late in the second half Steve lead for the first time, 5-4. I wasn't toast just yet though and clawed it back to 5-5 with not much left on the clock. At this point, a draw was enough for me to clinch my second title in two days! I know, bit greedy really. Anyway, as evil as they come, I needlessly conceeded a throw-in adjacent to my box but Cox didn't return to his central position leaving a gaping hole. Steve immediately saw the danger and directed his throw-in to the danger zone and slotted home. Arrrrggghhhh!!!! I still remember the clock time 4:54, which meant it was too late even for the restart. Gutted!!! Nevertheless it was still a memorable end to an unlikely tournament. Well done to Ste for keeping ice cool on a hot evening to take the HELLAND IV title. 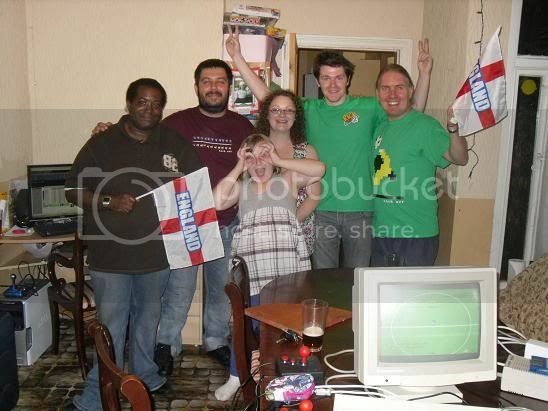 We said our goodbyes to Ste and Donna, and then had an experiment with 4-player kick-off! Costas had brought a nifty piece of equipment that plugs into one of the parrallel ports to allow for two extra joystick. Then Carl suggested wouldn't be great if we could play 2v2 on the pitch???? Of course he wasn't aware one of the KO2CV features allows just that! With Ellie playing as substitute for Steve, it was great fun! And definately something I'd like to explore again sometime. 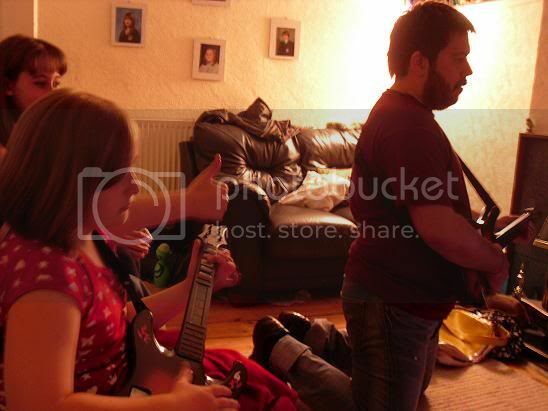 Next it was time for Carl to go (see you next time mate ) before succumbing to the kids demands and play some guitar hero. It was great to see Costas having fun with the kids like that, and "Steady as she goes" sounded better than ever. It was getting late now and time to settle the young ones. I was ready for a snooze too but couldn't resist a final KO2 x 5. Probably a bad decision from my point of view because Costas was flowing like a river! 5-3, 7-5, 5-4, 2-3, 0-1. Think the 0-1 kinda showed how tired we were in the end! By the time I surfaced the next morning I could see Costas and Ellie already outside playing footy whereas I barely had the energy to lift my cup of coffee! After a late morning fry-up we had time for a couple of games of Fish and Fruit, a word game to test Costas' english! Then it was that sad time to say our goodbyes. Nevertheless the weekend I felt had been a great success, you'd fitted in with (put up with!) our family life superbly! It was our pleasure having you over my friend, and it really could not have gone any better! Costas:"You know what, Garry. Keep practicing and both you and me can win the KOA World Cup one day!" Awesome pictures. Kostas should have brought a Greek flag along! gdh82 wrote: Costas:"You know what, Garry. Keep practicing and both you and me can win the KOA World Cup one day!" Garry:"You know what, Costas. Before we can win the WC, we must confirmed a WC. So let´s book these cheap tickets for 20€ to Düsseldorf"
There's always a recruitment angle! At Gaz's we were resigned to the fact that there probably wasnt going to be a tournament but I figured that we could still play a JFF. To be honest though just staying at the BBQ and chatting to our new greek mate plus Gaz's family was superb. Lots of things to do and chat as well as laugh about and simply not enough time! As it happens, Carl did eventually make it and it was a pleasure to meet a cracking bloke who had loads of enthusiasm - so much that it was infectous! Not only a fan of KO2 but the Amiga in general and he's certainly found the right place thats for sure. Got a little carried away when I suggested he has a free - brand new - greek stick but that was just the spirit of the weekend. Like the Kick Off at times - free flowing! When playing new guys in small local tournaments we feel it's more important I reckon to get to know them as opposed to demoralising them before they'v even started (although I have no qualms about doing this at the larger events! ) but Carl definetly showed some good touches and the game logic went against him when a scored pinged against the post, right out of play (which would have been an equaliser). He spent the night trying different control methods and so this would hinder anyone really. When I played recently with a Zipstick I was a shadow of what I can do and once Carl has his Amiga working after so and so years it'l be very interesting playing him again. I do believe this guy has what it takes because like the best best KO2 sportsmans he does it because he enjoys it. Not because he wants to win as much as he can. Although with this enthusiasm the wins will surely come - and like I always reminded myself when I first started playing. Enjoy the losses because then when you do get the wins you will saviour them all the more. Having warmed up at HELLAND III, Costas's true form will came to shine. The night before I managed some wins but I always noticed a running theme...I had managed to score first in all of them. But at HELLAND IV it was a different...Costas took the lead and unlike the night before, he was really highlighting the benefits of playing 'Balanced'. I really found it difficult because it was something I was totally not used to. Normally it's the other way round but the standard he was playing tonight was really impressive. I lost 4-2 and had no complaints just a shameful realisation of my own deficiency! For our second game I really had to summon every last ounce of knowledge iv got from the game and every last ounce of nerve too. Costas was on course for another victory against me but with 20 seconds remaining I got a draw. Despite this I was feeling pretty disappointed because I believed Gaz to have won it so imagine my suprise when that wasnt the case at all and I had a shout of coming first - however the person standing in my way was the HELLAND III Champ himself! It was only throught reading Gaz's result that I remembered the details of the game for I can only recall the last minute. With the game at 5-5 I just wanted another goal desperately to be crowned a HELLAND champ but to do i just had to ignore the clock. In these situations it's the best thing to do. Unsure if other players do it but I have to otherwise I never think there's enough time - but unlike the modern Football games like Fifa of Pro Evo, anything can happen in KO2 - right up until the last seconds! Yep, with 6 priceless seconds to spare. S-I-X seconds. A Tournament was won. There'd been many battles over the tournament but it all came to the last seconds and with Cox out of position I had just enough space to slot it home. Absolutely priceless! As indeed was the whole weekend. Get back to England soon Costas and we can do it all again!